At St Thomas Becket, our aim is that every child is enabled to reach their full potential in English through quality first teaching. Children are provided with a rich and varied diet of interesting and exciting English lessons which engage, extend and enrich children’s speaking, listening, reading and writing skills. Each classroom has a wide range of fiction, non-fiction and poetry available to support children’s acquisition of knowledge and encourage reading for pleasure. We have a well-equipped school library and ICT facilities to help children research their schoolwork and personal interests. The children are taught to read using the highly effective phonic scheme – Reading Write Inc, designed to stimulate and challenge children’s thinking and create enthusiastic, life-long readers and writers. Our shared and guided reading sessions begin from Reception and continue all the way through to Year 6. Our aim is for all children to develop a love of reading and we promote and encourage this through many of our school initiatives. 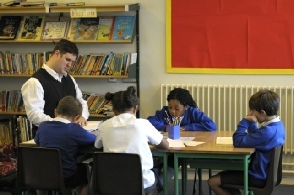 We encourage the children to write on a wide range of topics and for a variety of audiences. We understand the importance for children to write for a purpose and therefore our lessons are planned to stimulate and engage their imagination. Many of our literacy lessons are based on the CLPE’s (Centre for Literacy in Primary Education) Power of Reading Project, using highly-acclaimed texts as a stimulus for children’s reading and writing. As a school, we are also keen to engage the children in local and national issues and events, which they always find particularly enjoyable and interesting to learn and write about. The children are taught to use accurate spelling, grammar and punctuation throughout their written work. We teach the children to learn a basic handwriting script from Reception, developing into a fully cursive style by the end of Year 2. As a school, we now follow the 2014 National Curriculum programme of study for English, and are continually resourcing this area in order to support the children’s learning throughout the school.